Would you like a smartphone but are scared away by the price? Are you interested in learning about ways to reduce the overall price of a smartphone? If the answer to these questions is yes, then grab a cup of coffee and give yourself 5 to 10 minutes to read this article. You will learn some little known ways to save with a smartphone. First let me set the scene on why I wrote this article. My teenage daughter has been asking for a smartphone ever since she entered the world it seems. Well okay, maybe only for the last couple of years, but when a teenager wants something that badly two years seems like a lifetime! After researching the latest and greatest devices I always ended up with sticker shock and an upset daughter. However after some research, and looking at the problem as a whole, I realized that savings were possible. It is my goal in this article to highlight some of these items for your consideration should you be in a similar position. Smartphones are mobile phones, also referred to as cellular phones, that have the functionality of a small computer. Sure the display tends to be smaller, but the processing power and software actually turns these phones into mini computers. You can check your email, surf the web with a proper browser, take pictures, record video, get real time directions and much more. Oh, and it also makes and receives calls and texts, which is essentially the only thing that the older generation phones were capable of. How popular are smartphones? According to a recent study by Nielson, 3 out of every 5 mobile subscribers in the U.S now owns a smartphone. In terms of the actual numbers, by the end of 2013 it is estimated that there will be 1.4 billion smartphones in use across the planet, according to an ABI research report. Time to talk about pricing for these devices - in my opinion it is daylight robbery! Should a small phone really cost as much as a state of the art desktop computer? No it should not! How do the suppliers get away with this then - because they can! The pricing is remarkably consistent isn't it? Why do I think the pricing is too high? Well let's look at an example here, and compare the costs of the Apple iTouch (5th Generation) and the iPhone 5S. In Table 2, the prices of each are shown and I have included estimated adders to the iTouch, to bring it in line with the new features found in the iPhone5S. Having been in the Electronics industry for many years, both in digital design and semiconductor sales, I feel my estimates have some merit. Also note that these estimates are conservative, it is likely that the Apple buying power is such that the adders are significantly lower than this. My point to all of this is that, in my opinion, consumers are getting gouged when it comes to smartphone prices. Sure, profit has to be made but selling a device that should be the low $300s for $650 is ridiculous. Also note that the $300 includes profits already made on the iTouch! Anyway enough of my rants and I will now jump of my soap box. Feel free to add comments or questions at the end of this article if you have something to add or disagree with my estimates. What are your options I hear you say. Well a new device has just hit the market that has a comparable feature set to the iPhone 5S and the Samsung Galaxy S4, but is significantly lower priced. This device is the Google Nexus 5, which is actually manufactured by LG for Google. As you would expect from Google, it runs Android and is actually the first phone to hit the streets that runs the Android 4.4, KitKat OS. At this moment in time this device is without a doubt the best budget smartphone in the marketplace. Google Nexus 5 - only $349! If you go direct to Google Play and buy this unlocked device, you can currently get it for $349. This is a fair price in my mind and a price I was willing to spend on a smartphone for my teenage daughter. Her opinion - "It's Awesome!". Why does Google not charge the same as others? Well this is not because Google is a non-profit company, that is for sure! It just has a different model. Google wants as many consumers as possible to be using smartphones, and ideally with the Android OS as it promotes the Google brand. Google makes their money through Ads that consumers click over the lifetime of the product. The same is true for other Google products, for example the Google Car. The Google car will drive itself meaning the driver has more free time to use the Internet and click Ads! Again, just my opinion, but a reasonable one I feel. Anyway, back to the Nexus 5, the specs for this device are impressive and are highlighted in Table 3 below, and each spec is compared to the iPhone 5S. Camera 8 Mega pixels, 1.3 Mega pixels front facing. HD video recording. Optical image stabilization. 8 Mega pixels, 1.2 Mega pixels front facing. HD video recording. Optical image stabilization. Looking at the specs you can see that the devices are very close in functionality. The Nexus 5 has a better display and battery life, but the 64-bit architecture of the A7 gives the iPhone5S the edge in terms of raw performance. That being said, if you are an Apple lover no doubt you will pay the extra $300. For those wanting a budget smartphone that has impressive specifications and supports LTE (in other words fast Internet access), the Nexus 5 may be worth considering. Ebay: You can get some great deals on Ebay for smartphones. There is a lot of competition so pricing is competitive, and you can pick up new phones at discount or used phones at half price sometimes. Refurbished: Go to the cellular providers websites and check out their refurbished phones. They usually have a collection of new and old phones with good discounts. Family/Friends: Sweet talk your family and friends if they are getting ready to upgrade their phone, or persuade them it is time! Costco: Stop by the Costco phone booths in their stores. Sometimes some great deals can be had. Holiday Sales: You can pick up some great phone deals around the holidays, especially Black Friday and Cyber Monday. Camera: Most people have a point and shoot camera. No need to get one now as you have a good camera on your phone. Also there are thousands of additional apps that enable you to do quick and automatic photo editing on your phone, so that saves valuable time. Also the convenience of being able to automatically upload pcitures to social media websites, directly from your phone, is a great time saver. Remember when you had to upload to your PC then upload from there to Facebook? Camcorder: Potentially, there is no need for a standard camcorder anymore. Your device will likely have HD video recording capability. You now have all of this in one device. GPS: No need to carry a GPS device in your car, your phone has GPS built-in and is integrated with Maps to give you directions, traffic, satellite views and much more. Of course, this relies on good cellular coverage so keep that in mind. Laptop: Depending on your computing needs, you may not need a laptop. Some smartphones and tablets have large displays and high performance processing power and this could remove the need for a laptop for some people. Portable DVD players: Stream movies from Netflix to your smartphone or tablet and keep your kids entertained in the car, without the need for portable DVD players. Also, with the new Chromecast device from Google, choose a movie from Netflix on your phone and cast it direct to your TV. Music Player: Store all of your music, play it when jogging, or in the car with Bluetooth, or connect it to your receiver and play throughout your house. Again, no need for a separate music player. Home Phone Service: You could potentially ditch your home phone service and just use your cell phone. Need to make International calls? Download a mobile VoIP app and make cheap long distance and International calls. Alternatively if your friends and family have smartphones, use Facetime or Google video hangouts, and enjoy video calls for free. I personally do this with family in Europe and it works great! Internet Service: Use hotspot/tethering capabilities on your phone (i.e. cellular to WiFi hotspot) and then use this for Internet at home. External Backup Drives: Your photos, videos, notes and more can be automatically sent to the cloud and stored through iCloud, Google Drive, Dropbox and the likes. In the cloud your files are stored with RAID drive redundancy, so you are not at the mercy of your single external hard drive. Alarm Clock: Sure it's not a big expense but again this functionality is built-in and works across time-zones. Books and Magazines: You need a decent display size here but electronic literature is cheaper than print. Final thoughts on other potential cost savings. 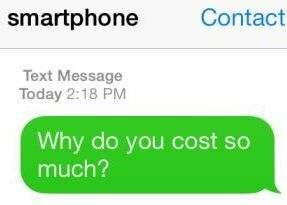 Buying smartphones for the entire family can be an expensive proposition. For younger kids, who are usually with you either at home or in the car or on vacation, why not buy a tablet or iTouch type device. These devices are very competitively priced, they all have WiFi, and so essentially have the same functionality as the phones but without the cellular access. You could either buy a tablet that is cellular enabled and then pay an additional $10 or so for monthly access. Alternatively, use the tethering (also called hotspot) functionality so the WiFi enabled devices communicate to the outside world through your smartphone. This can save a lot of money each month! Smartphone devices are changing the way we run our lives, there is no doubt about that. However they tend to be priced way higher than they should be and this is preventing some consumers from jumping in. There are options though that can get you smartphone enabled, with all of the latest features, and for almost half the price of the leading devices in the marketplace. Also, when you consider the savings that can be made, by removing the need to buy and carry cameras, camcorders, GPS devices and the likes, smartphones become a very interesting proposition. Isn't it time you jumped on board? Please feel free to ask us questions or point out other ideas that were not covered in this article, using the comments section below. We answer ALL questions, usually within 24 hours. Excellent article, most helpful, many thanks! Amazon recently offered its unlocked version of the Fire phone for $199. That price includes Amazon Prime for one year, making the cost of the phone (for me, a Prime member) only $99. I use it with a T-Mobile prepaid plan for $30/month plus the $5 monthly tax. -> Response: Some deal, great information, thanks Joy! Another saving (at least for me) is gas for my car. I am self employed and I used to have to deposit checks every couple of days into my bank which is about 5 miles away. Now I use the Chase app to take a picture of my checks and it appears in my account like magic! I was asking T-mobile about Nexus 5 and they said it was $450! -> Response: Yes that is correct, seems to be a special through the Google play store only. When I purchased this for my daughter it was direct from Google play and $349. This works great with T-Mobile. Some confusion right now as to which carriers support it. T-Mobile does and forums suggest AT&T does too. It's an LTE phone but there are different frequency bands which may be why there are some question marks over Verizon support.